I have recently moved to Saugerties, New York, a small mountain town on the Hudson River in the Catskills. I’m don’t think I can put a linear reason on why I moved, I just “knew,” this is what I had to do — instinctively and intuitively. After years of work, I’ve hit a point in my life where I trust my instincts and intuition. This was not always true. I agree with Clarissa Pinkola Estes’ line, in Women Who Run with Wolves, that most of us, myself included, are instinct injured. Instinct is an active, immediate response; unlike intuition it is neither sense, nor feeling. You slam on the brakes to keep from getting hit. You cross the street when you see the crazy man arms stretched forward, hands reaching towards your neck, pirouetting in your direction. We’re hardwired to instinctively respond, to save ourselves, from that which threatens our lives. I also think that we are equally hardwired to save our loved ones from that, which threatens their lives. Think of the car that rolls on top of a child and the mother, who is all of 5’2” and maybe 100 lbs dripping wet, lifts the car and pulls her child to safety. Instinct gave her, gives us, superhuman strength; emotional and physical. I think the first profound damage to instinct is the survival mechanisms we develop as very young children in order to be loved and survive. As a small child our lives are 100% dependent on our parents. The child of a dysfunctional parent, or parents, unconsciously knows she’s not safe, and will bend, shape, and become whatever she has to, in order to survive and be loved. This is the child’s first learning, and as the child grows, acts as foundation for her developing interpersonal skills. Ultimately, she carries these learned survival mechanisms, and the behaviors that accompany, them into adulthood. Instinct and intuition are intertwined, they compose a whole, and a piece of the divine within all of us. Intuition is the subliminal processing that serves instinct. Unlike instinct it is a sense, a knowing, and not arrived at through rational thought. When the instinct is injured, the intuition supports the injured instinct. Again, this is all rooted in the need for love and survival. A woman begins to heal her instinct when she declares, “I am not doing this anymore!” and then asks, “Why do I keep doing this?” That’s when the path rises up to meet her. The challenge is not to beat yourself up as you look for answers. The challenge is to bring in this very human and very wounded piece of self and love her into wellness; not beat and harangue her, for not knowing any better, even if intellectually you think you should. If beating yourself to a pulp worked because you intellectually knew better, I would strongly recommend it. As it is, beating yourself to a pulp does little more than keep you locked in an identity and behavior pattern that is no longer of any benefit to you. You are judging yourself according to an old and invalidating paradigm. In my experience, the only thing that can break the debilitating and withering self-judgment, rooted in that paradigm, is love, and the willingness to accept and love self beyond all reason. Be willing. You have virtually nothing to lose except situations that are sucking the life out of you, and everything to gain — joy, freedom, your tribe, and your Goddess given connection to life and the world. And no, it’s not going to happen over night and yes, it will be messy, and pop you right out of your comfort zone. You will loose some friends, you will gain some friends, and the friendships you keep will become stronger than ever. You will model for your children, and others, that seeking one’s authenticity and living from that authenticity is right and noble. You will come into your natural wildness and point blank refuse to be controlled, determined or defined by anyone but you. This is what I know to be the result of healing instinct and honing intuition. What’s better than that? The Mother Goddess has recovered from the arduous birth of the sun at Yule. The light of the longer days awakens her. She stretches, hears her son, the growing God, running up and down the hall with the greyhounds. She smiles. She can feel his warmth from her bed. Deep within the earth, the Grandmother feels the slight quickening of the seeds in the ground around her. “The God is young, but He’s getting stronger,” She thinks. “Grandmother?” The maiden asks. She fixes her rheumy eyes on her granddaughter, stirring life’s mysteries in Her cauldron. “Yes, child,” She says. “It is time.” The Maiden very carefully stops stirring; she taps the wooden spoon on the side and waits. The Grandmother peers into the swirling blue and green mists. “Slowly,” She says, “there is no hurry.” The maiden carefully inserts the spoon into the energy and begins to stir in the opposite direction from before— clockwise. “Return to return,” the Maiden croons. Waking whispers of the coming spring rise out of the mists and enfold her. Soon She will journey to the surface. Imbolc is a sabbat, a festival of light and fertility and a fire celebration, of purification. In my experience there is a subtlety to Imbolc, unlike a sabbat like Beltane (May Eve). When I still had a small garden, in February I’d clear out the beds and cut back whatever needed cutting back. Most of the gardeners I knew cut everything back in the fall but I never did. I also left the fallen leaves because I knew it was better for the earth and the winter survival of her little creaturas. It wasn’t a huge task cleaning out the beds, it wasn’t overwhelmingly strenuous and exhausting, but this quiet, small action prepared the beds for that which I would soon be planting and that which (hyacinths, daffodils, bleeding hearts) would be returning. In other words, this quiet, small action was a determining factor in the health of that year’s garden. Imbolc is a powerful time to burn away something that is of no benefit to the garden of you. It can be a person, a place, or a thing. Nine times out of ten, what we have in our lives that we don’t want is a direct result of low self-esteem, which is rooted in our programming and socialization. So you might try writing low self esteem on a piece of paper, hold it in the flame of a candle with hot dog tongs, and when it catches drop it in a burning pot; either a cauldron, a clay pot, or a pasta pot works quite well. Say: I bless and release you from me. Follow with affirmations. I deeply love and approve of myself – all of me. I am fearless in my pursuit of my truth. I am magnetic and receptive to my deepest and highest good. I am loved beyond all reason. The burning and the affirmations will begin to change the course of the river. If you’d like to go further with the exercise, before the burning, chant to Ganesha, three times round the mala beads. I have written the chant as it sounds, not as it’s spelled. When you’re finished chanting, say the following, which I have adapted from a spell by Silver Raven Wolf. I have clothes on my back, food to eat. At this moment there is no tomorrow, there is no yesterday, there is only today. I have clothes on my back, food to eat, and a place to stay. I am perfectly ok. The universe provides for me in every way. Ganesha, come to me, come to me. This is true as I will and as I say. I am the source of loving and being loved. 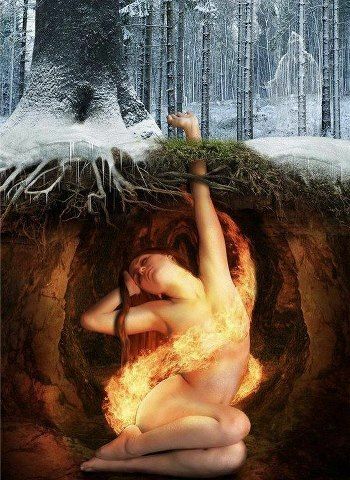 The fires of Imbolc represent our light and our warmth, our illumination and inspiration. Brigid is the Goddess of Imbolc, which makes perfect sense because She is the Goddess of inspiration and creativity. On the eve of Imbolc, Brigit walks the earth, so if you want to leave a piece of clothing outside for her blessing, do. Brigit is one of the ancient Mother Goddesses of Ireland. When the church began to convert the British Isles, they couldn’t shake the peoples’ faith in her so they made her a saint. Only one but it’s a doozie! 30 minute readings for $50. 45 minute and hour readings remain the same! As ever if you pay with paypal, readings are $5 more because of processing costs.